The Diverge X1, fully loaded. To seek and diverge. While most road bikes will do, the design of the Diverge allows for wider tires (38c max), opening the doors to the ever trending adventure bike segment. The Diverge was a trendsetter, an icon of it's time of introduction. Now we've seen a market full of gravel capable adventure bikes, but what makes the Diverge so compelling was the tight line it walked between high-end race looks and pure utility and exploitability. It's my every day bike, my weekend bike, my training bike, my gravel grinding racing steed. The spirit of the Diverge is rooted in exploration. The frame is designed for wider tires, even knobs. The geometry and frame design optimized to smooth everything out. The Pacific Northwest demands a bike with fenders. The Diverge combines wide tires and integrated fenders for the perfect combo. The nearly full-coverage Plug & Play fenders can stay on year round for their good looks and integrated design. The first in line for Specialized's 'Project Clean', adopting subtlety in color and frame graphics. 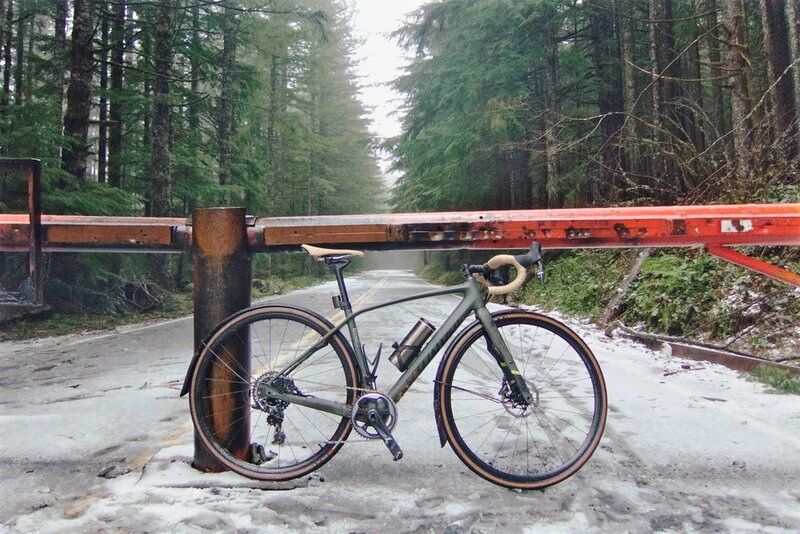 The Diverge inspired rides over snow covered logging roads, even when they weren't there. Always ready for an adventure, just be sure you have the legs to match its potential. The Diverge comes stock with extra padded bars to take off the edge. 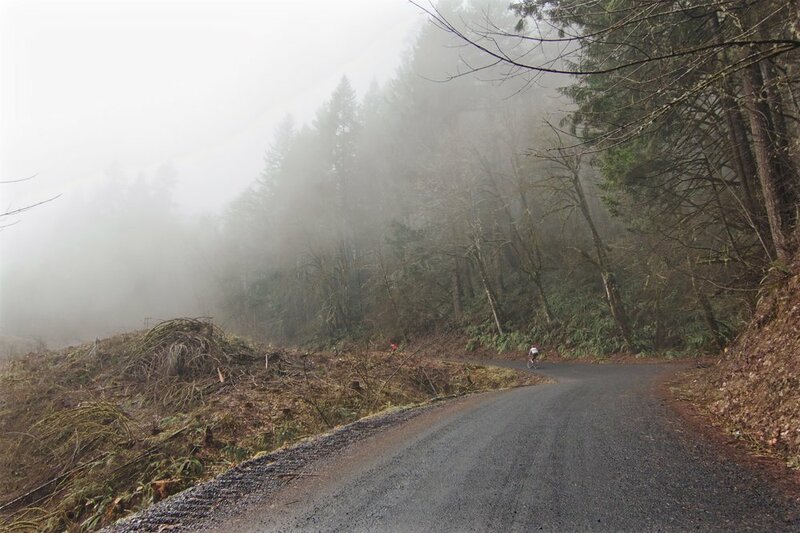 Nothing compares to the feeling of hydraulic disc brakes in the cold and wet winters of Portland. Just enough traction by way of volume. The Diverge is a full carbon affair. The sloping top tube and tube shaping is quite attractive from a design standpoint. It's one of the best looking gravel grinders on the market in my opinion. The frame also introduces a more refined approach to their proprietary Zertz vibration dampening technology, mounted to the undersides of the tubes, as opposed to wedged in between, for a cleaner look. Much like the Crux I own, wider tires instantly make any drop bar bike feel like it can do more, corner better, descend faster, brake safer and smooth bumps in the road. Volume is key and I've managed to squeeze 38c Specialized Triggers in there. Swap out for some 24c Turbo tires and it changes from a gravel road grinding beast to a svelte road racing machine. Another shining quality of the Diverge's design is the thoughtful placement of expandability. I was looking squarely at the Diverge for it's integrated Plug & Play Fender mount fittings, integrated and tucked away into the mold of the frame. While the 'plug & play' nature of setting up the fenders from Specialized took some considerable time, once sized and installed it took little to no effort. The frame is also ready for SWAT technology, but I opted to go with an Arundel adjustable bottle cage to make room for a Snowpeak Kanpai thermos for the cold Northwest winters. The front fork also has fittings for a front rack. I picked up a Tubus Tara front pannier setup with Ortlieb bags for the occasional heavy duty commute. and someday bike packing trip. The Diverge was a trendsetter, an icon of it's time of introduction. While not the most agile climber or fastest sprinter the Diverge sits somewhere in the "yeah I can do that, too" space of road bikes. I've even contemplated racing cross on one, as part of the never-ending search for the one bike to rule them all. The Diverge's low bottom bracket height and not nearly as stiff front fork will keep it from a call-up, but maybe as a B bike in the pit. To be clear, I consider the Diverge the jack of all trades, including light trail riding. It's definite sweet spot is on the road less travelled, littered with stones and dirt. It handles with such confidence and has brought me home safely on numerous graveled occasions. The build I went with is a fully stock SRAM Rival X1, complete with hydro-disc brakes and a monstrous 10-42 cassette. I was skeptical of the road application of such a celebrated movement from mountain biking. I love 1x systems, but wasn't sure if there'd be enough range for such an audacious bike. I was pleasantly assured of it's range, only losing out on the top end of gearing when things got real fast. My fully loaded Diverge also includes front and rear Flux lights, Plug & Play fenders with Planet Bike extenders, a Tubus Tara front rack with Ortlieb bags, an Arundel adjustable cage fitted with a Snowpeak Kanpai thermos. The Diverge has a few nagging qualities that keep it from a perfect 10. While the overall weight isn't so much an issue, the stock Axis wheels could have been better spec'd or at least come tubeless ready. I'll probably upgrade to Roval wheels when they go caput. I'm mostly bummed about the SCS dropout spacing. I still don't get it, and it sounds like they're phasing the proprietary wheel specification in their future bikes anyway. This really limits the consumer to Specialized wheels as well as other compatible accessories like trailers and stationary trainers. A near perfect score was earned after a full year of riding on everything imaginable. I have since sold my Roubaix SL4 in favor of keeping one do-it-all road bike. The value, dependability and versatility of the Diverge is only met by its good looks and attention to detail.